This monster is the cover card for The Duelist Genesis. This monster is the signature card of Yusei Fudo in the anime. This is replaced by Stardust Spark Dragon in the manga. As a Synchro Monster, it is the first signature card of a main protagonist to originate from the Extra Deck instead of the Main Deck. This card was designed by Kazuki Takahashi himself. In the TCG, this card has been printed in all rarities, except for Parallel Rare (it has been printed in Duel Terminal Parallel Rare in the OCG however). This card has the same ATK of 2500 as the signature cards of other main protagonists, which are Yugi Muto's Dark Magician, Jaden Yuki's Elemental HERO Neos, Yuma Tsukumo's Number 39: Utopia, Yuya Sakaki's Odd-Eyes Pendulum Dragon and Yusaku Fujiki's Firewall Dragon. This monster appears to be the antithesis of Red Dragon Archfiend. Their poses mirror each other and have opposite color schemes. Also, their effects oppose each other as well. The effect of Red Dragon Archfiend focuses on destroying opposing monsters, as this card focuses on protecting monsters from being destroyed. The fact that these two cards rival each other is a possible reference to the original Yu-Gi-Oh! series; Dark Magician, the signature card of Yugi Muto, with ATK equal to that of Stardust Dragon, is the rival of Blue-Eyes White Dragon, the signature card of Seto Kaiba, with ATK equal to that of Red Dragon Archfiend. Also, Yugi Muto and Seto Kaiba are rivals, just like how Yusei is rivals with Jack Atlas. Furthermore, the ace card of Akiza Izinski, Black Rose Dragon, also has an effect that opposes Stardust, and a similar ATK and name to Red-Eyes B. Dragon, the ace of Joey Wheeler. Like Joey, Akiza was initially highly hostile to Yusei, but quickly warmed up to him and became one of his closest companions. It is also interesting to note that if both monsters are on the same side of the field and for some reason this card does not attack, their rivalry arises at the End Phase, when their owner must choose to either destroy this card with the effect of Red Dragon Archfiend or negate its effect with this card. This card has the most forms out of all the Signer Dragons. This was the first Signer Dragon to be a featured card of a Yu-Gi-Oh! 5D's episode. This monster and all of its versions have colored orbs on their bodies that are similar to the orbs seen on their wielder Yusei Fudo's choice of clothing (specifically his shoulder, elbow, and knee guards, while smaller ones decorate his collar, gloves, and boots). The connection is clearly seen on Debris Dragon, whose orbs are orange, like Yusei's. This card appears in the artwork of E HERO Pit Boss. This card has the most support cards of all the Signer Dragons (with or without anime cards). Debris Dragon seems to be a younger version of this card. With the release of Gold Series 3, this card is the first Signer Dragon to be printed as a Gold Rare. The abilities of this Signer Dragon represents Yusei's willingness to risk his own life, whether it be for his friends, his loved ones, or strangers in need. In fact Yusei had this card stolen from him by Jack after Yusei decided to save Rally instead of keeping the Stardust Dragon card, only for Yusei to regain this card later, similarly to this card's effect of Tributing itself to save cards from destruction, only to come back later. This card did not appear as a statue in Yu-Gi-Oh! ZEXAL - Episode 015. But it is mysterious of how Roku knows that this monster has its own statue. In the Facebook game Social Empires, there is a dragon that has a strong basis on this monster's artwork design called Star Dragon. This is the only Signer Dragon to not have been used as a Synchro Material for Shooting Quasar Dragon. In fact, this is also the first time that this card was Summoned after Shooting Star Dragon due to the effect of Shooting Quasar Dragon in Yusei's Duel against Z-one. This card resembles both Clear Wing Synchro Dragon and Enlightenment Paladin. All three have 2500 ATK and 2000 DEF. They are used by a main protagonist as one of their signature cards. This card and Clear Wing are WIND Dragon monsters. The effects of this card and Clear Wing can negate and destroy harmful effects. This card and Clear Wing are used by Synchro Summon practitioners. While this card has a defensive effect, Clear Wing has a much more aggressive effect. This card and Enlightenment Paladin are Level 8. This card and Enlightenment Paladin have Graveyard recovery effects under certain circumstances. This card and Enlightenment Paladin have an upgraded form as a Level 10 Synchro Monster with 3300 ATK. It is the only ace monster whose Attribute is neither DARK nor LIGHT. However, its manga counterpart - Stardust Spark Dragon - is a LIGHT monster. It is the only ace monster with a Level that is not 7. It is the only ace monster who does not have a Chaos form (Dark Magician has Magician of Black Chaos/Dark Magician of Chaos, Elemental HERO Neos has Elemental HERO Chaos Neos, Number 39: Utopia has Number C39: Utopia Ray V/Number C39: Utopia Ray Victory and Odd-Eyes Pendulum Dragon has Odd-Eyes Rebellion Dragon/Odd-Eyes Raging Dragon). Dragon Knight Draco-Equiste: If you copy the effect of "Stardust Dragon" and then Tribute this card to activate that effect, you cannot Special Summon this card back from the Graveyard during the End Phase. Dragon Knight Draco-Equiste: If you copy the effect of "Majestic Star Dragon", then when you return "Dragon Knight Draco-Equiste" to the Extra Deck during your End Phase, you will also Special Summon "Stardust Dragon" from the Graveyard. Majestic Star Dragon: The effect to return "Majestic Star Dragon" to the Extra Deck is mandatory. It activates even if an effect that prohibits Special Summons is applied. In that case, you return "Majestic Star Dragon" to the Extra Deck" but will not Special Summon "Stardust Dragon". Majestic Star Dragon: The effect to Special Summon "Stardust Dragon" targets the "Stardust Dragon". It activates even if there is no "Stardust Dragon" in the Graveyard. Majestic Star Dragon: You can use "Stardust Dragon" as a Synchro Material Monster for "Majestic Star Dragon" even if it's being treated as a Tuner. Majestic Star Dragon: You can Summon "Majestic Star Dragon" even if "Majestic Dragon" is being treated as a non-Tuner and "Stardust Dragon" is treated as a Tuner. Stardust Xiaolong: If you have more than one "Stardust Xiaolong" in your Graveyard when you Synchro Summon "Stardust Dragon", you can activate the effects of each of them. Starlight Road: You cannot activate “Starlight Road” during the Damage Step. Starlight Road: Negating and destroying a card and Special Summoning “Stardust Dragon” do not happen at the same time. First you negate and destroy the card, then you Special Summon “Stardust Dragon.” If you don’t Special Summon, the effect of “Starlight Road” ends after negating and destroying the card. Synchro Magnet: If you Synchro Summon "Stardust Dragon" while you have Synchro Magnet in your hand and "Stardust Xiaolong" in your Graveyard, you can Special Summon both of them. Wicked Rebirth: If you Special Summon “Stardust Dragon” with “Wicked Rebirth,” you can Tribute “Stardust Dragon” for its effect. After it is Tributed, “Stardust Dragon” is no longer targeted by “Wicked Rebirth.” Therefore its effect is restored and applied normally (so it negates an effect and is Special Summoned back to the field during the End Phase). Starlight Road: You can respond to the Summon of "Stardust Dragon" from "Starlight Road" with "Bottomless Trap Hole". Example: If "Starlight Road" is Chained to the activation of "Heavy Storm", then "Heavy Storm" is Chain Link 1 and "Starlight Road" is Chain Link 2. When "Starlight Road" resolves, it will negate the activation of "Heavy Storm" and destroy it (at the same time, due to the “and if you do” conjunction), then it will Summon "Stardust Dragon". At this time, the activation of "Heavy Storm" has been negated, so the chain ends. The last thing to happen is the Summon of "Stardust Dragon", so players may respond to that summon with any legal card, including "Bottomless Trap Hole". : Starlight Road and Bottomless Trap Hole"Starlight Road"s newest errata states that it does not negate the activation of the card or effect it was Chained to, which makes this ruling invalid. Tributing this card is a cost to activate the effect. The effect does not target. : Synchro Monster > Stardust Dragon You can activate the effect during the Damage Step. : Can the effect of "Stardust Dragon" negate the effect of "Ally of Justice Catastor"? Example: If the effect of "Ally of Justice Catastor" activates during the Damage Step, then the effect of "Stardust Dragon" may be Chained to negate the activation of "Ally of Justice Catastor"s effect and destroy it: Can you use the effect of "Stardust Dragon" to negate the effect of "Ally of Justice Catastor" and destroy it?, even if that "Stardust Dragon" is the monster battling "Ally of Justice Catastor". To activate "Stardust Dragon"s effect against another effect, the other effect must destroy a card when it resolves. You cannot activate "Stardust Dragon"s effect when "Night Assailant" is sent from the hand to the Graveyard, since it does not destroy card(s) (even though "Night Assailant"s Flip Effect destroys a card). : When a card can destroy other cards, and you activate a different effect of the card which does not destroy other cards, can you chain "Stardust Dragon"s effect? "Stardust Dragon"s effect can be chained to an effect that does more than destroy cards. You can chain "Stardust Dragon"s effect to "Ring of Destruction", even though it also inflicts damage. : Can you chain "Stardust Dragon"s effect to cards which both destroy a card and also do something else? You can chain "Stardust Dragon"s effect to the effect of a Continuous Spell or Trap with a chainable effect that destroys cards, such as "Skull Lair". : Can "Stardust Dragon" negate the effect of a face-up Continuous Spell/Trap Card? You cannot chain "Stardust Dragon"s effect to effects like "Barrel Dragon", "Blowback Dragon", "Blind Destruction", "Sand Gambler", "Dangerous Machine Type-6", "Snipe Hunter", "Gambler of Legend", etc., since it is not known if they will destroy a card or not, depending upon the coin toss or the die's result. In addition, for an effect like "Time Wizard" which is certain that it will destroy a monster on the field regardless of the coin toss's, etc., result, "Stardust Dragon" can be chained. Furthermore, for an effect like "Crush Card Virus", "Deck Devastation Virus", etc., when a face-up monster would be destroyed, you can chain "Stardust Dragon" effect. If the only monsters on the field are face-down monsters, since it is unsure if they will be destroyed by "Crush Card Virus's", "Deck Devastation Virus's", etc. effect, you cannot chain "Stardust Dragon" effect. 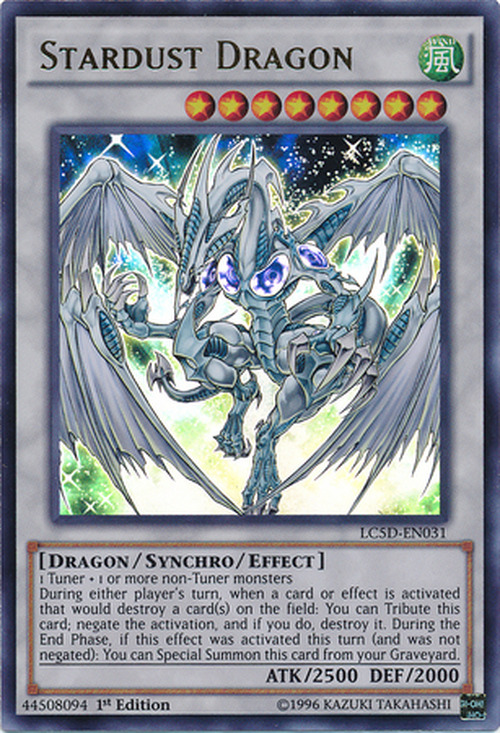 : Can you chain "Stardust Dragon"s effect to a card which may or may not destroy a card? If "Stardust Dragon" Special Summons itself during the End Phase, and your opponent activates "Torrential Tribute", then you can activate "Stardust Dragon"s effect to negate "Torrential Tribute". "Stardust Dragon" will then Special Summon itself again during the same End Phase. : Can "Stardust Dragon"s effect be activated multiple times during the same End Phase? Counter Trap Cards are Spell Speed 3, so you cannot activate the Spell Speed 2 effect of "Stardust Dragon" in Chain to the effect of a Counter Trap Card like "Magic Jammer", "Seven Tools of the Bandit", or "Divine Wrath". : Can the effect of "Stardust Dragon" be activated in Chain to the activation of a Counter Trap Card? Suppose that the effect of "Stardust Dragon" is Chained to "Mystical Space Typhoon", and then "Emergency Provisions" is activated at Chain Link 3 by sending "Mystical Space Typhoon" to the Graveyard. In this case, "Stardust Dragon" cannot destroy "Mystical Space Typhoon", but "Stardust Dragon" still negates its activation, and you can still Special Summon "Stardust Dragon" from your Graveyard during the End Phase. 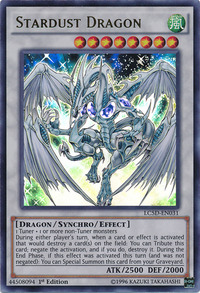 : If the effect of "Stardust Dragon" cannot destroy the card, then can it Special Summon itself? Ally of Justice Catastor: "Listed above, in the main section"
Ambitious Gofer: The effect of "Ambitious Gofer" may or may not destroy a monster at resolution, so the effect of "Stardust Dragon" cannot be Chained to it. : Can you Chain the effect of "Stardust Dragon" to the effect of "Ambitious Gofer"? Deck Devastation Virus: "See above; listed above under "Crush Card Virus"." Eradicator Epidemic Virus: "See above; listed above under "Crush Card Virus"." Horus the Black Flame Dragon LV8: The effect of "Horus the Black Flame Dragon LV8" is not considered to destroy Spell Cards on the field. Therefore, its activation cannot be negated by the effect of "Stardust Dragon". : If a Spell Card is activated from the hand, and the effect of "Horus the Black Flame Dragon LV8" is activated in a chain to negate its activation and destroy it, can the effect of "Stardust Dragon" be activated in a chain to negate the activation of the effect of "Horus the Black Flame Dragon LV8"? Also, if a Set Spell Card on the field is activated, and the effect of "Horus the Black Flame Dragon LV8" is activated, can its activation be negated by "Stardust Dragon" effect? Royal Oppression: If "Royal Oppression" is Chained to "Monster Reborn", then you can then Chain the effect of "Stardust Dragon". During the End Phase, you can Special Summon "Stardust Dragon" from the Graveyard. : Can the effect of "Stardust Dragon" be Chained to the effect of "Royal Oppression"? Ryko, Lightsworn Hunter: If you activate the effect of "Ryko, Lightsworn Hunter" and choose to not destroy a card, then the effect of "Stardust Dragon" cannot be Chained to it. : If the effect of "Ryko, Lightsworn Hunter" does not destroy a card, then can you Chain the effect of "Stardust Dragon" to it? Royal Oppression: When the effect of "Stardust Dragon" which negates the activation of the effect of a Spell Card/Trap Card/Effect Monster Card is activated, the effect of "Royal Oppression" cannot be activated. To negate the effect of "Stardust Dragon" which Special Summons itself, you must activate the effect of "Royal Oppression" in Chain to that effect of "Stardust Dragon" during the End Phase. : Can "Royal Oppression" negate the different effects of "Stardust Dragon"? Skill Drain: "Skill Drain" has no effect on "Stardust Dragon". For the first effect, Tributing "Stardust Dragon" is a cost, so "Stardust Dragon" is not on the field and is unaffected by "Skill Drain". The second effect activates in the Graveyard, so "Skill Drain" cannot negate it. : Will "Skill Drain" negate the effects of "Stardust Dragon"? Wicked Rebirth: After "Stardust Dragon" is Special Summoned by "Wicked Rebirth", "Stardust Dragon" can activate its effect. Then, "Wicked Rebirth" is no longer face-up on the field and "Stardust Dragon" is no longer targeted by it, so the effect of "Stardust Dragon" will not be negated and "Stardust Dragon" will negate the activation of an effect and destroy the card. : Is the effect of a "Stardust Dragon" Special Summoned by "Wicked Rebirth" negated if it is not face-up on the field at the resolution of its effect? Skill Drain" has no effect on "Stardust Dragon". For the first effect, Tributing "Stardust Dragon" is a cost, so "Stardust Dragon" is not on the field and is unaffected by "Skill Drain". The second effect activates in the Graveyard, so "Skill Drain" cannot negate it. : Will "Skill Drain" negate the effects of "Stardust Dragon"? If "Banisher of the Light"s effect is active and you Tribute "Stardust Dragon", or if "D.D. Crow" removes "Stardust Dragon" from play after it is Tributed, then "Stardust Dragon" will not Special Summon itself during the End Phase. This applies even if "Stardust Dragon" is later returned to the Graveyard. : If "Stardust Dragon" is Tributed and removed from play, does its effect activate? If "Stardust Dragon" or "Stardust Dragon/Assault Mode" do not negate the effect of a Spell/Trap/Effect monster, during the End Phase they cannot Special Summon themselves. For example, if "Divine Wrath" negates the effect of "Stardust Dragon" or "Stardust Dragon/Assault Mode", then you cannot activate the effect during the End Phase. : When "Stardust Dragon/Assault Mode" does not negate the activation of the effect of a card, can it Special Summon itself during the End Phase? If "Stardust Dragon" was Special Summoned by and has its effect negated by an effect like "Descending Lost Star" or "Synchro Change", then when it Tributes itself to activate its effect, the effect will still be negated even though "Stardust Dragon" is no longer face-up on the field. Thus, the effect of "Stardust Dragon" cannot negate the activation of an effect which destroys a card on the field. : If the effect of "Stardust Dragon" is activated after it was Special Summoned by the effect of "Synchro Change", then will the effect be negated? Assault Mode Activate: If you do not have "Stardust Dragon/Assault Mode" etc in your Deck, then you cannot activate "Assault Mode Activate" by Tributing "Stardust Dragon" etc. If an effect is Chained to "Assault Mode Activate" so that there is no "Stardust Dragon/Assault Mode" in your Deck, then "Assault Mode Activate" resolves without effect. : Can "Assault Mode Activate" be activated when you do not have the "/Assault Mode" monster in your Deck? De-Synchro: Suppose that "Stardust Dragon" Tributes itself and then Special Summons itself back to the field during the End Phase. If it is targeted by "De-Synchro", then it returns to the Extra Deck, but you do not Special Summon the Synchro Material Monsters from your Graveyard. : Can you Special Summon the Synchro Materials if "De-Synchro" is activated on a "Stardust Dragon" that Special Summoned itself? Dragon Knight Draco-Equiste: You can activate the effect of "Dragon Knight Draco-Equiste" by selecting a Dragon-Type Synchro Monster in the opponent's Graveyard, such as an opponent's "Stardust Dragon". : Can you remove from play a monster from your opponent's Graveyard for "Dragon Knight Draco-Equiste"? Dragon Knight Draco-Equiste: Suppose "Dragon Knight Draco-Equiste" gains the effect of "Stardust Dragon". If it negates the activation of "an effect which destroys a card(s) on the field" and destroys it, then during the End Phase you cannot Special Summon "Dragon Knight Draco-Equiste" from the Graveyard through the effect of "Stardust Dragon". : Can "Dragon Knight Draco-Equiste" be Special Summoned from the Graveyard during the End Phase if it gains the effect of "Stardust Dragon"? Dragon Knight Draco-Equiste: "Majestic Star Dragon"s effects during the End Phase all resolve as part of the same effect. So, if "Dragon Knight Draco-Equiste" gains the effect of "Majestic Star Dragon", then during the End Phase you can return "Dragon Knight Draco-Equiste" to the Extra Deck to Special Summon "Stardust Dragon". : If "Dragon Knight Draco-Equiste" gains the effect of "Majestic Star Dragon", then can you Special Summon "Stardust Dragon"? Galaxy-Eyes Photon Dragon: If you activate the effect of "Galaxy-Eyes Photon Dragon" when it battles a "Stardust Dragon" Special Summoned by "Starlight Road", then at the end of the Battle Phase both monsters return to the field. : If "Galaxy-Eyes Photon Dragon" battles with and banishes a Token or "Embodiment of Apophis", then do they return to the field at the end of the Battle Phase? Majestic Star Dragon: The effect of "Majestic Star Dragon" which returns it to the Extra Deck during the End Phase and Special Summons "Stardust Dragon" is mandatory, so it will activate even if "Vanity's Fiend" or "Jowgen the Spiritualist" are face-up on the field. In this case, "Majestic Star Dragon" will return itself to the Extra Deck, but "Stardust Dragon" will not be Special Summoned. : Will the effect of "Majestic Star Dragon" activate during the End Phase even if "Vanity's Fiend" is on the field? Majestic Star Dragon: You may Synchro Summon "Majestic Star Dragon" by using a "Stardust Dragon" which is being treated as a Tuner Monster. If a non-Tuner Monster has its name treated as "Majestic Dragon" and "Stardust Dragon" is being treated as a Tuner Monster, then you may Synchro Summon "Majestic Star Dragon" by using the non-Tuner "Majestic Dragon", the Tuner "Stardust Dragon", and one other non-Tuner Monster as Synchro Material Monsters. : Can a "Stardust Dragon" being treated as a Tuner Monster be used as a Synchro Material monster for "Majestic Star Dragon"? Majestic Star Dragon: The effect of "Majestic Star Dragon" which returns it to the Extra Deck during the End Phase targets one "Stardust Dragon" in your Graveyard. If there is no "Stardust Dragon" in your Graveyard, then this effect still activates; "Majestic Star Dragon" is still returned to the Extra Deck, but no "Stardust Dragon" is Special Summoned. : Does the effect of "Majestic Star Dragon" which activates during the End Phase target "Stardust Dragon"? Majestic Star Dragon: If the effect of "G.B. Hunter" is active, then during the End Phase the effect of "Majestic Star Dragon" to return itself to the Extra Deck still activates. However, "Majestic Star Dragon" cannot be returned to the Extra Deck, so when resolving the effect "Majestic Star Dragon" is not returned to the Extra Deck and "Stardust Dragon" is not Special Summoned. : Does the effect of "Majestic Star Dragon" which returns it to the Extra Deck still activate if "G.B. Hunter" is on the field? Majestic Star Dragon: The effect of "Majestic Star Dragon" which returns it to the Extra Deck and Special Summons "Stardust Dragon" during the End Phase is a mandatory effect. The player must activate the effect; he cannot choose to not activate the effect and leave "Majestic Star Dragon" on the field. : Must you activate the effect of "Majestic Star Dragon" which returns it to the Extra Deck during the End Phase? Malefic: You cannot Special Summon a Synchro Monster if it was not properly Synchro Summoned previously, such as if it was banished directly from the Extra Deck. Thus, you cannot use an effect like "D.D.R. - Different Dimension Reincarnation" or "Return from the Different Dimension" to Special Summon a "Stardust Dragon" which was banished to Special Summon "Malefic Stardust Dragon". Also, "Blue-Eyes White Dragon" and "Red-Eyes B. Dragon" are Normal Summon monsters, so they may be Special Summoned even if they are banished directly from the Deck. : Can "D.D.R. - Different Dimension Reincarnation" Special Summon a "Stardust Dragon" which was banished to Summon "Malefic Stardust Dragon"? Solemn Warning: You can Chain "Solemn Warning" to "Starlight Road" or "Macro Cosmos", even if there is no "Stardust Dragon" in the Extra Deck or no "Helios - The Primordial Sun" in the Deck. : Can you Chain "Solemn Warning" to "Starlight Road"? Stardust Dragon/Assault Mode: The effect of "Stardust Dragon/Assault Mode" targets 1 "Stardust Dragon" in your Graveyard. Starlight Road: The effect of "Starlight Road" which negates and destroys does not resolve at the same time as the effect which Special Summons "Stardust Dragon". "Stardust Dragon" is Special Summoned after the card is destroyed and its effect is negated. If "Stardust Dragon" cannot be Special Summoned, then the effect finishes resolving with negating the effect and destroying the card. : Are the "destroy" and "Special Summon" effects of "Starlight Road" treated as being done at the same time? Starlight Road: "Starlight Road" may be activated even if a card like "Vanity's Fiend" is on the field, or if there is no "Stardust Dragon" in your Extra Deck. The effect of "Starlight Roadfrom the Graveyard the "Stardust Dragon" which was Tributed to activate its effect. : Can you activate "Starlight Road" while "Vanity's Fiend" is preventing you from Special Summoning? Starlight Road: "Royal Oppression" may negate the effect of "Starlight Road", even though it is unknown at activation whether or not "Starlight Road" will Special Summon "Stardust Dragon". "Royal Oppression" may negate the effect of "Starlight Road" even if "Stardust Dragon" may not be Special Summoned, such as if "Vanity's Fiend" is on the field or if there is no "Stardust Dragon" in the Extra Deck. : Can "Royal Oppression" be Chained to "Starlight Road"? Starlight Road: Suppose that "Elemental Hero Absolute Zero" is returned from the field to the Extra Deck and its effect activates. If you Chain "Starlight Road" to the effect, then the effect is negated and the "Elemental Hero Absolute Zero" in the Extra Deck is destroyed. Also, you can then use the effect of "Starlight Road" to Special Summon "Stardust Dragon". : Can "Starlight Road" negate the effect of "Elemental Hero Absolute Zero" and destroy it? Tributing "Stardust Dragon" is a cost to activate its effect. "Stardust Dragon's" first effect can be activated during the Damage Step. "Stardust Dragon's" effects do not target. "Stardust Dragon's" first effect can still be chained if it is the only card that will be destroyed by the activated effect. "Stardust Dragon's" effect can be chained to the effect of a Continuous Spell or Trap Card, like "Blaze Accelerator" or "Skull Lair". "Stardust Dragon's" first effect cannot be chained to an effect that may or may not destroy card(s) on the field, like "Barrel Dragon" or "Snipe Hunter". If "Crush Card Virus" is activated and there is a face-up monster on the field that will be destroyed, "Stardust Dragon's" effect can be chained. If "Royal Oppression's" effect is activated to negate the Special Summon of a monster, like "Cyber Dragon" or "Gladiator Beast Gyzarus", "Stardust Dragon's" effect cannot be chained because the monster being Special Summoned is not considered to be "on the field" until its Summon is successful. "Stardust Dragonsecond effect can only be chained to an effect that will destroy card(s) on the field. For example, if "Night Assailant" second effect is activated when it is discarded, "Stardust Dragon's" effect cannot be chained because this effect does not destroy card(s) on the field. If "Stardust Dragon" is removed from play when its first effect is activated (by "Banisher of the Light", etc. ), or it is removed from the Graveyard after its first effect is activated it cannot be Special Summoned with its effect during the End Phase. If you Special Summon "Stardust Dragon" during the End Phase and your opponent activates "Torrential Tribute", you can chain "Stardust Dragon's" first effect to negate "Torrential Tribute". If you do, you can Special Summon "Stardust Dragon" again during the same End Phase. If "Stardust Dragon" is attacking or being attacked and its effect is used in the Damage Step before damage calculation, damage calculation does not occur. If your Defense Position "Stardust Dragon" is attacked by "Red Dragon Archfiend" and it is destroyed by battle, you cannot chain "Stardust Dragon's" effect to "Red Dragon Archfiend's" effect that destroys your Defense Position monsters.